About us | 877 WORKSHOP — Handcrafted goods for men. Made in Germany. 877 Workshop. Handcrafted goods for men. Made in Germany. We are Sylvia and Daniel Janssen – a husband-and-wife team who loves almost forgotten crafts and techniques and bring them back to life with new designs. In our workshop in Hamburg, Germany, we manufacture high-quality, beautifully designed goods for men with a contemporary and effortless look. Our accessories are ideal companions for everyday, subtle suiting a business outfit as well as a casual look. — We are two passionate makers who love doing everything under one roof – from inspiration to design to fabrication. — Since 2012 we manufacture uniquely designed accessories for men from highest-quality materials. — All metal parts, closures, hooks, buckles, beads, rivets are handcrafted by us. — We only use solid metals such as 14k Gold, 925 Sterling Silver, brass, bronze, aluminium. — Our suppliers are well choosen and close to home: metals, leather and textiles come from Germany, waxed canvas from Scotland. — We hand select our vegetable tanned premium leather produced from a small family run German Tannery. — We offer custom engravure for a personal touch and making a perfect gift. — Our repair service provides long-life fun with our goods. — We are happy to answer your questions and provide you with your shipping details quick and reliable. Our work spirit is to strive for quality, to rely in the best materials, a lot of artisanal experience and even more passion. We just love to create and make you nice products that we ourselves love and use. We have a soft spot for old crafting techniques and are passionate collectors of historical tools and machines we work with on new designs. Daniel, who worked 7 years as a master in engraving before getting his master in arts & design, engraves steel stamps on a 1960s engraving machine, which then are hardened and burned to emboss various designs with 5 tons pressure into thick bronze, brass, copper or sterling silver coins. 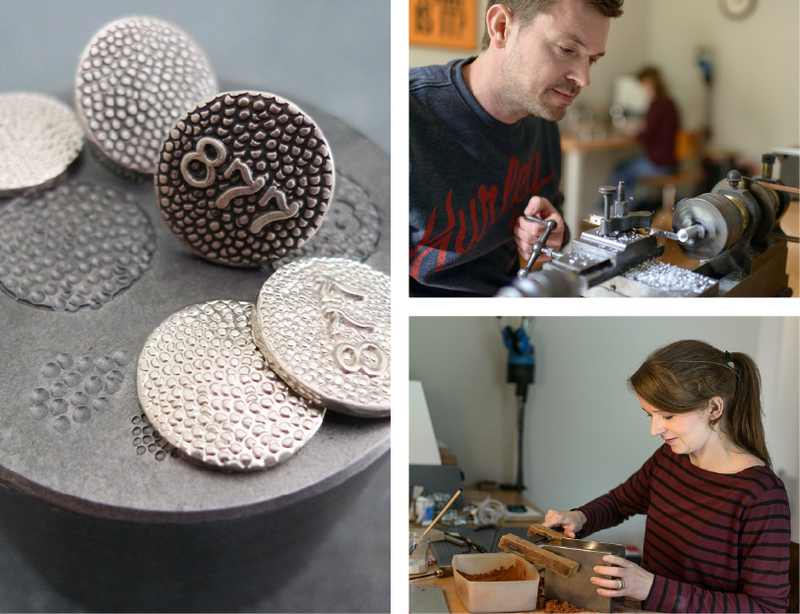 The motif coins are then filed, shaped, polished, patinated and processed to push buttons, badges, pins and closures. We use a lathe from 1928 for turning closures, rivets and buttons and historical tools like burin, steel tools, an engraving machine and an engravers ball as well as hand stamps for a special handcrafted look and feel. We own a very rare collection of historic, hand-engraved die forms from 1910 from Pforzheim / Germany – the former, internationally known through the Paris World Exhibition in 1900, center of European jewelry production. In the highest precision the Pforzheimer engravers have engraved filigree designs by hand into the hard steel. 10 tons of pressure are needed to deform the metal in the steel mold to form a ring or a saint badge. Our original Zippos are also embossed with the help of the historical press molds. Filigree portraits, three-dimensional animal forms or maritime anchors are combined with elaborate hand engravings to create a unique talisman zippo. Besides metallworks we are absolutely fascinated by historic machine embroidery. We have a vintage Chain Stitching machine from 1920 and a freemotion embroidery machine from 1950. Both machines are operated freehand – the Chain Stitching machine is operated by guiding the needle with a crank handle along the drawing, for the free motion embroidery a stitching frame is moved by hand to create the motif. You can literally write and paint with theses machines. The process is extremely time-consuming and It is not surprising that is was replaced by computer embroidery to be economically viable. But in the end the making is so much fun and the results are absolutely unique with a charming imperfect look and feel. Our vision of a heavy duty and beautiful belt buckle brought us to use the centuries-old technique of sand casting. Every piece is casted in a lost mould: the buckle frame is pressed into a form filled with fine oiled sand, the impression is poured out with 1100 degrees celsius hot bronze, the sand mould is burned and lost and has to be built up again to cast the prong. For each buckle frame and prong we have to build up a new sand form. So it takes quite a lot of time to make a hand full of buckles. But the result is worth it: the heavy quality look and feel with its grainy surface and raw rugged character is absolutely unique and inimitable. Our leather is also very well chosen - vegetable tanned premium leather from a German tannery, which was founded in 1875 and is now run by the fifth generation of the family. The leather is tanned with oak bark and refined with selected fats and waxes for extra durability. Their traditional art of tanning needs much more time than current industrial tanning techniques, but the benefits relating quality, look and feel remain unmatched to this day. The tanning process takes at least eight weeks, the leather gets enriched by natural oils and is then dried very gently at room temperature what saves energy and improves the quality of leather. It is a honest natural product, skin neutral and suitable for allergy sufferers. The surface of the leather is natural (aniline) - it has no color layer to keep the beautiful natural texture with fine wrinkles and pores. None of our products are alike, more or less traces of manufacturing are visible, roughly forged parts, irregular shapes and natural tanned leather with small wrinkles and scars are part of our design and important for our look. One should simply see that our products are handmade. Honest craftsmanship made in Germany. We are happy to customize most of our products with your individual letters or numbers. You find an overview of our customizable products here. Please read about the different options and additional costs in the several product descriptions. * 877 is the code of the color silver.